Down/the Line is a web journal, documenting the day to day between surf, travel and life in a van. The idea is to share the spirit of far away lands and inspire people to get out there. We are Mathieu and Ingrid Liot. A multicultural couple living on the road since February 2015. We are both surfers, artists, and highly aware of the need for change in human consciousness. Our journey began in Sag Harbor, New York, and our ultimate goal is to get to Patagonia by van, rolling through the Panamerican Highway and surfing all the way down south. We wish to document our daily lives through photography, illustrations, video and audio recording. We’d like to explore the way others live and share experiences with people we meet along the way. At the same, time create awareness of our environmental impact on climate change, and lead with example as we share some individual, easy options to live a less wasteful life. We want to celebrate the spirit of exploration, in the greenest possible way. This adventure started as an impossible dream that we couldn't stop dreaming. It is a path that teaches us every day, some times with hard lessons. We wish to share our journey and hopefully inspire you to take the first step into the unknown. If you don't try, you will never know. Thank you for reading. Please share our project if you liked it, and don't forget to subscribe to our newsletter. "I Can. I Will. 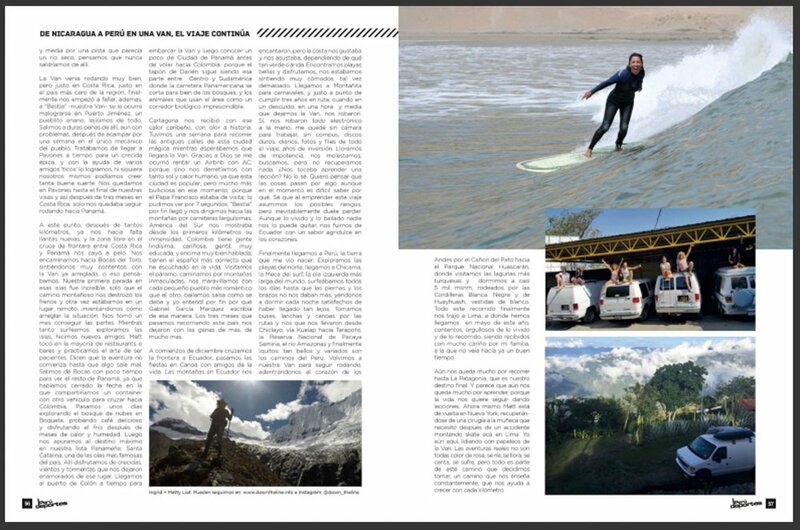 Women Overlanding the World" is 264 pages of pure inspiration. In this book we introduce you to 50 women overlanders who have traveled the globe by bicycle, van, suv and motorcycle. Despite all messages telling them these places were too dangerous or these types of journeys were too hard for women, they went anyway. This week we're traveling from Antigua in Guatemala to Playa El Tunco in El Salvador. We're looking for a community to visit but end up having capturing a whole different story!